Mord im Arosa initially attracted me because of it’s unique hook: a game that relies on players’ sense of hearing. Did it live up to my expectations? Find out below! 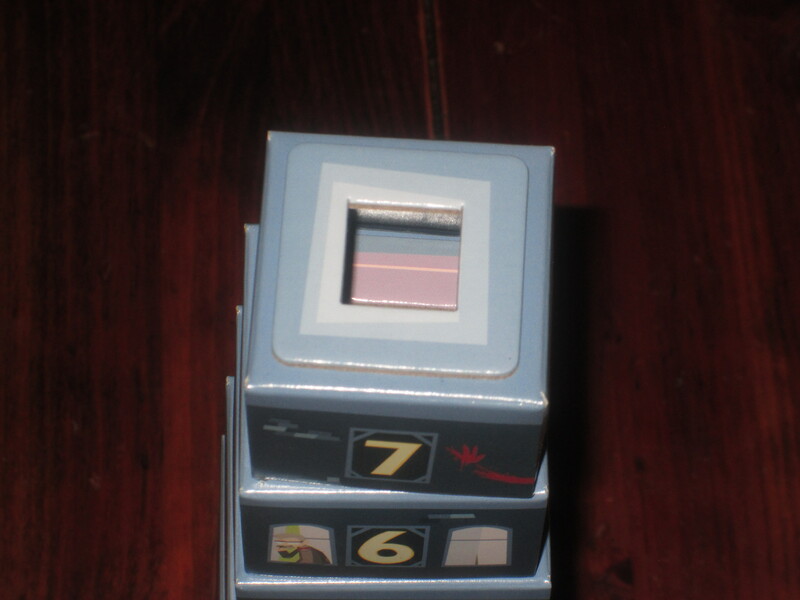 Players receive a stock of twenty wooden cubes in their color and set up the investigation board and the Hotel Arosa cube tower. One player drops two red cubes into the tower, representing two murders. Each player then drops two cubes of their color into the tower. 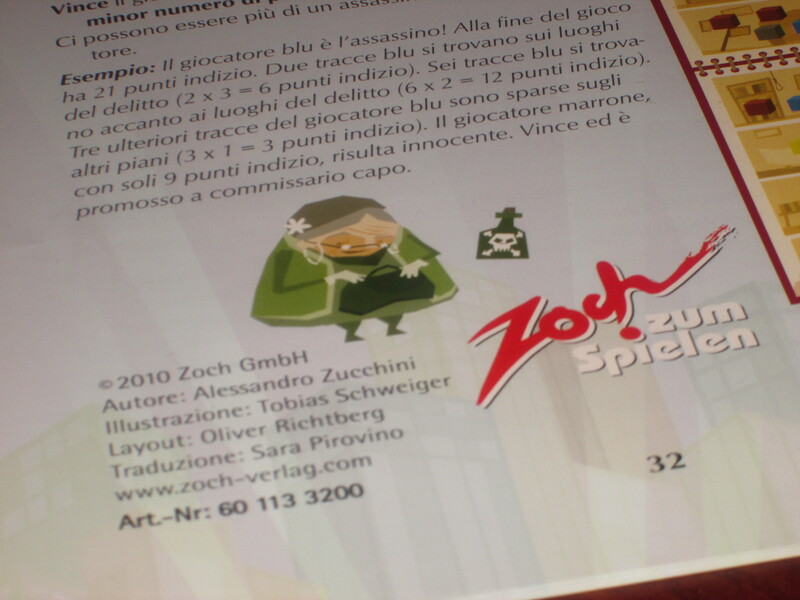 The game is played in two phases: discovering the murders and the investigation. When players are trying to discover the murder, they announce where they think a red cube has fallen and lift up that floor. 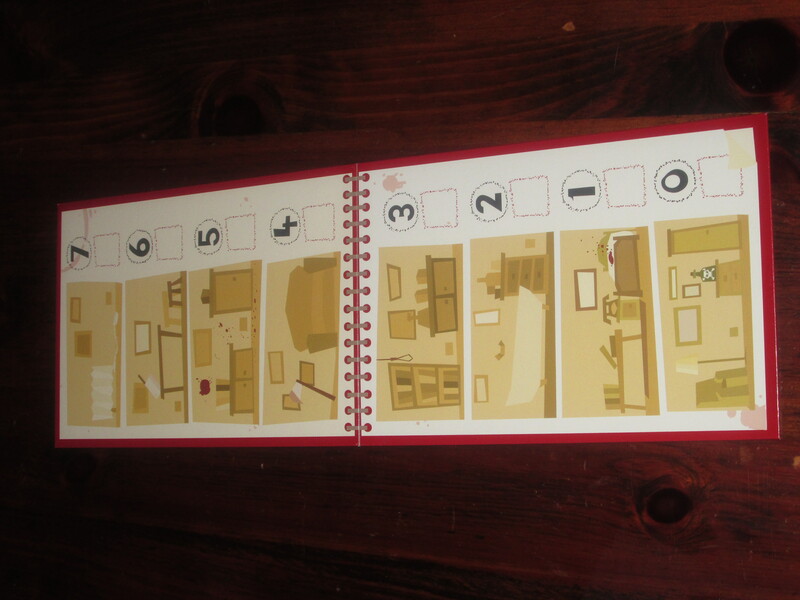 If a red cube is there, they place the red cube on the corresponding floor on the investigation sheet. In addition, each other player who has a cube on the floor adds one cube from their stock to the investigation sheet at that floor. (The player who discovers the murder overlooks any evidence pointing to him- or herself.) If the murder is not on that floor, they add one cube from their stock in the top of the cube tower. In either case, all player cubes that were revealed are placed back in the top of the tower. Once both murders have been discovered, the investigation begins. On their turns, players may either accuse other players or cover their own tracks. If they accuse other players, they must name a floor number and say which players’ cubes they think are there. Each player named who has cubes on that floor adds cubes from their stock to the matching floor on the investigation sheet. All cubes are picked up and then dropped through the top of the tower. (For each named player who isn’t represented on the floor, the accusing player adds a cube to the top of the tower.) Players may instead cover their tracks by naming a floor number. For each of their own cubes on that floor, they may remove a corresponding cube from the investigation sheet. Cubes are then placed back in the tower, with an additional cube added for an incorrect guess. Play continues until one player has either ten cubes on the investigation sheet or no cubes in stock. Players score the investigation sheet, with cubes in closer proximity to the murders counting for more points. The player with the fewest points wins. Mord im Arosa, or Bored im Arosa? Mord im Arosa is a showpiece game. It’s a novel concept with a novel hook, and it’s the kind of game that naturally draws other players in because of its novelty. I’ve never played a game before where I had to rely on what I heard rather than my own wits or dexterity. 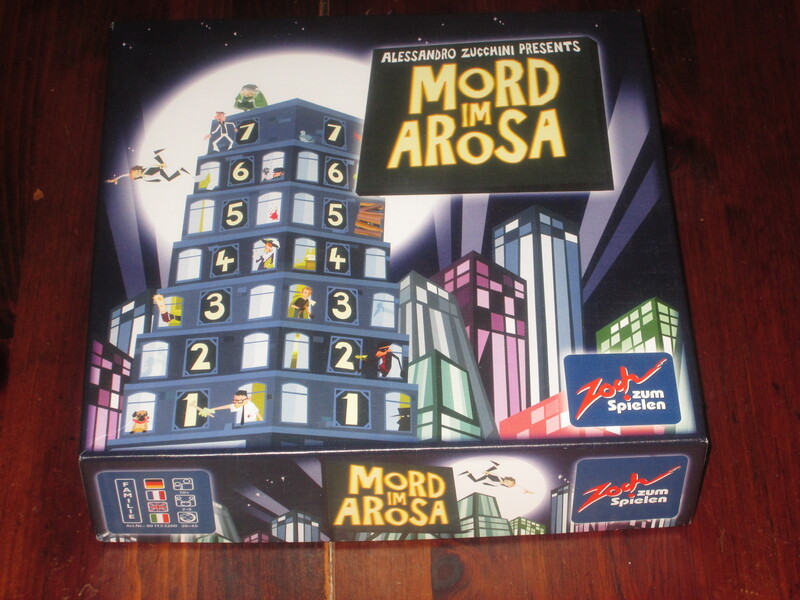 And for that reason alone, Mord im Arosa is worth a look. But after several games of it, while I enjoy the game, I am content to pass my copy along. A look down the cube tower. You can’t see very far down in my picture, but while this doesn’t randomize cubes quite so well as a Queen Games cube tower, it does a good job of sorting the cubes to different floors, and it’s surprisingly hard to guess where they’ve landed much of the time. 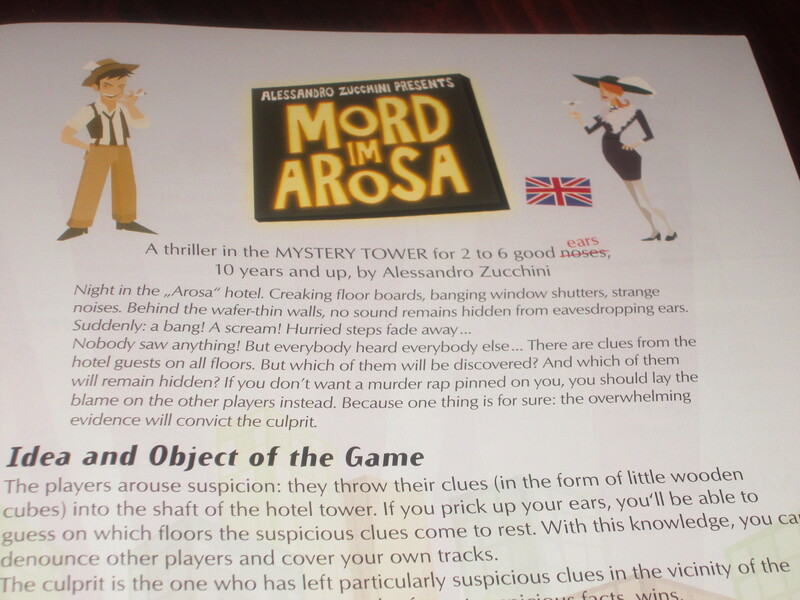 The components in Mord im Arosa are a good place to begin. The cube tower is functional and works as a good centerpiece. When set up, it’s the kind of game that attracts attention and makes others curious. 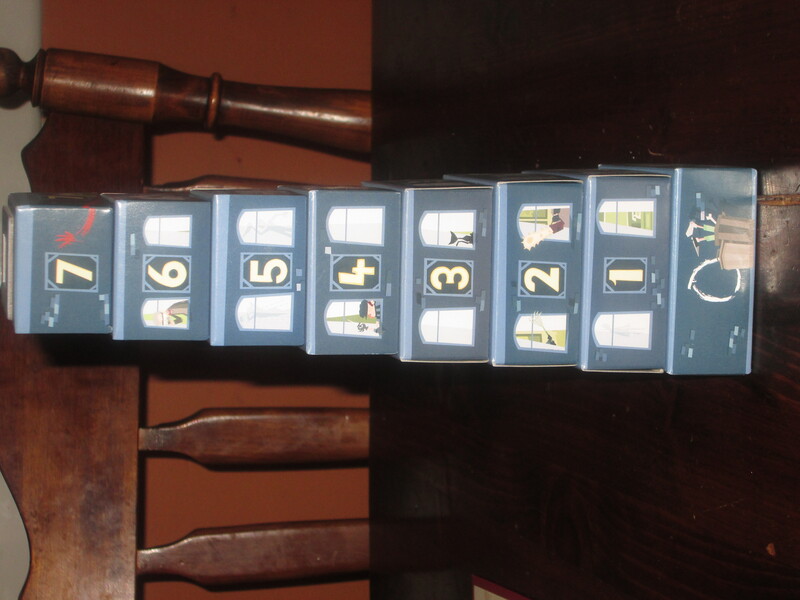 There are occasionally bogus drops–with murders or cubes hitting the top few floors again and again–but for the most part, the tower offers enough differentiation to make the game interesting. 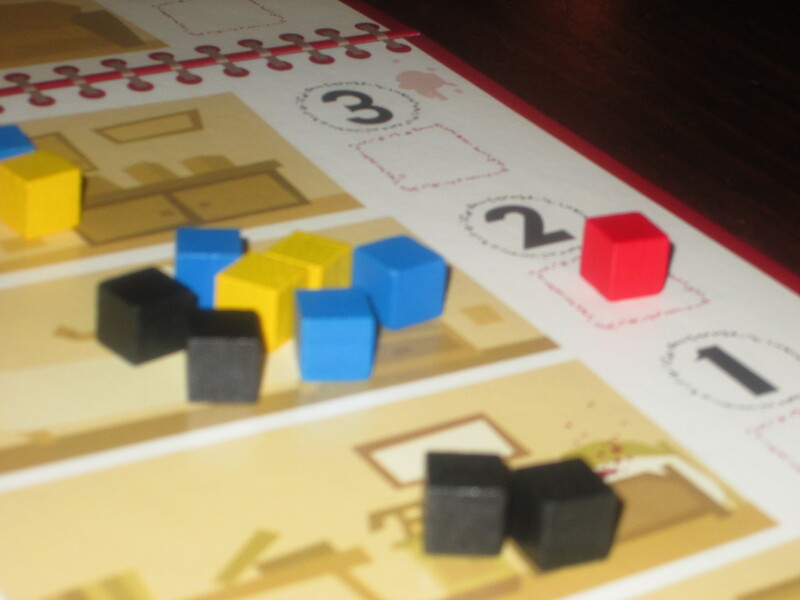 The walls of the Hotel Arosa are thick paper, but the floors are chipboard, which make enough sound when cubes hit them to clue players in to where the cubes are. The floors lift easily and do not often spill their contents, which is necessary for this game to work. The artwork in the game is lighthearted and not at all macabre, which is a relief considering the grisly subject matter paired with the silly mechanics. The investigator sheet is nicely illustrated and large enough to see at a glance where players are in the standing. The rules are nicely illustrated and clear. The rules of the game are straightforward. Usually I include a truncated version of the rules in the “how it works” section to give only a brief feel for the gameplay, but the rules above are almost all of the rules for the game. While subject matter may keep you from sharing this game with kids, older kids should be able to understand the game without much difficulty. Mord im Arosa supports up to six players, and it works decently at all counts. My favorite number to play with is four, as it seems like the best balance of downtime and player interaction. Clearly, this woman is up to some mischief. Mord im Arosa is more of a social experience game than anything else. Every group I’ve played it with has recognized that the game is a little silly. Grown adults are sitting around a table, straining to listen to cubes drop so they can more accurately guess where they’ve fallen. The game introduces lots of fun situations as players confidently lift a floor only to discover there’s nothing on it, or when they accuse one player when all the players are well represented (and get off scot-free). There’s the fun of hearing cubes hit the table and knowing exactly where one cube is (which introduces a special rule). There’s the fun of getting into character, of accusing your friends and being accused in return. There’s the thrill of revelation when you lift a floor and reveal its contents (although the thrill is slightly tempered since decisions are light and the game doesn’t hinge on them). The investigator sheet for the game. The red murder cubes go off to the right, and the colored player cubes go beside them. The board looks like a notepad, which is a nice touch. Blue, black, and yellow are all prime suspects in this murder. Similarly, while the game is novel, almost the entire game is built on its novelty. That is, while the cube tower is interesting, the game itself isn’t. Once the novelty of the cube tower wore off after a few games, I wasn’t that interested in playing the game afterward. Love Letter, the microgame darling, left a similar impression. While it’s novel to have a game that encompasses only sixteen cards, eventually (sometimes very quickly) you realize that there are…only sixteen cards and not much game there. This isn’t to say that novelty never works. Coconuts is built on the novelty of monkey catapults, and I am willing (and even itching) to play it at almost every opportunity. Splendor is built around the gimmick of the thick chips, and yet there’s still a game there that I want to play again and again. Camel Up has a dice pyramid that is a fun and novel way to both choose and roll a single random die–but there is a game that, when the dice pyramid is just a randomizer, still merits exploring. The gimmick in Mord im Arosa is interesting, the ten games or so I’ve played of it were fun, and I’m willing to play more if someone else wants to. But considering my limited shelf space, I’m willing to let this guest leave my hotel.